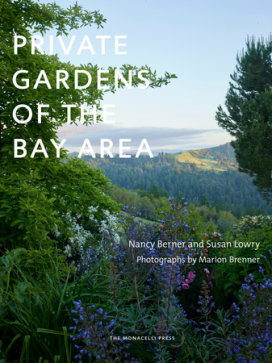 Private Gardens of the Bay Area (2017) by Susan Lowry and Nancy Berner, with photographs by Marion Brenner, is a beautiful book. Lowry and Berner, seasoned garden writers, have teamed up for several other titles including Gardens of the Garden State, Gardens of the Hudson Valley, and Garden Guide: New York City. They know gardens, can write about gardens well, and seem to have a knack for finding beautiful landscapes that they know readers will adore. It can be difficult to read books about California gardens without feeling envious of all the different plants—and extended growing season—available to designers and gardeners. Private Gardens of the Bay Area is no exception to this. However, even when it’s clear that certain plants wouldn’t be hardy in our Northeastern landscapes, the 35 gardens featured are inspirational and a joy to behold. With an interesting mix of modern and classical designs from four regions—the Peninsula, San Francisco, East Bay, and Marin Sonoma Napa—Private Gardens of the Bay Area is timely and inspirational eye-candy for gardeners, designers, and garden enthusiasts.